Imagine that you just landed at the Helsinki Airport (Vantaa), you got into town and suddenly… hunger. What restaurant should I choose? is the question that pops into mind. Well, let me show you. We mentioned food here a couple of times before. We named the restaurants in Finland (all of them in Helsinki) that have a Michelin Star in the article where we showed Gordon Ramsay tasting traditional Finnish food. A dish from the restaurant Gaijin. Source (CC: by-sa). If you want to taste Finnish food without leaving home, we have a category on the blog where we sometimes include recipes of different dishes, for instance desserts, Christmas dishes, and traditional main courses. It is the Finnish Food category. Also, interesting food habits, like the Finn’s passion for salty liquorice (salmiakki) can be found on the blog. Besides the list of restaurants in the Michelin Guide for Finland, there is a secondary, lesser known list from this company. It is the “Bib Gourmand” list, and a mention there means that the restaurant offers great value for money, even if the food hasn’t been awarded any Michelin Star. These restaurants have affordable prices – not cheap ones, though – and are therefore a must-try if you want to eat great without spending a fortune. Below, I have listed the restaurants in Finland that entered the “Bib Gourmand” list, all of them in Helsinki. If you click on the name, you will be redirected to their website, where you can find their address and phone number, as well as the menu and prices. If you go for individual dishes, naturally they’ll be more expensive than in menu form. Some of these websites are pure delight. A dish from the restaurant “Grotesk”. Source. 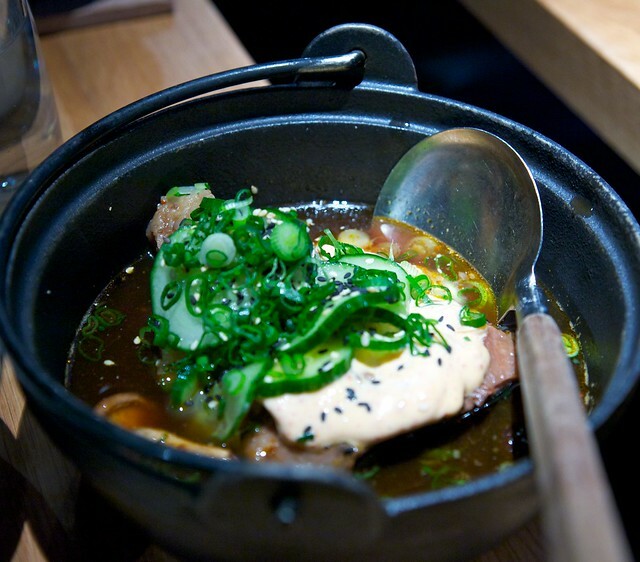 The first restaurant in Helsinki that appears on the Bib Gourmand list is Farang. Their menu features modern Asian cuisine – Thai – and is very well situated, in the historic Kunsthalle Helsinki. The price of the menu is 28€. The second is the Gaijin, which also features Asian food, but in this case from North Asia: Japan, Korea and North of China. Its menu costs – if you choose one or another – between 29€ and 59€. The restaurant Grotesk is specialized in meat. The menu costs 26€, and the style of food it offers is Finnish food. It has a cozy bar that opens in the afternoon, which creates a nice environment. 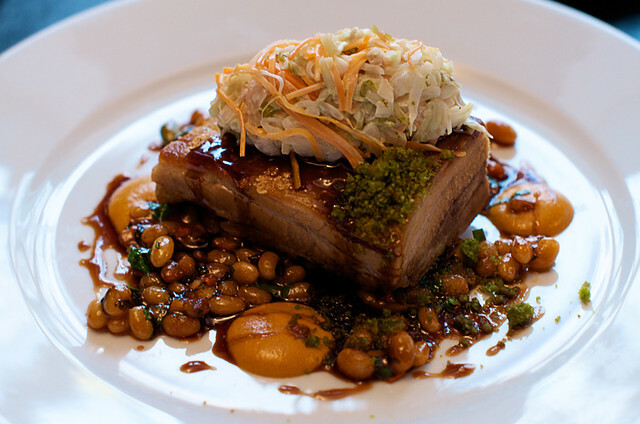 The last featured restaurant in Helsinki on the list is Solna. It offers regional food from Helsinki, and the menu price is between 37€ and 44€. It is somewhat farther from the center than the others, but if it is on the Bib Gourmand list it has to be worth it. There is another restaurant in Helsinki that we couldn’t help but feature as well. We placed its photo on our Facebook page some time ago and it generated a lot of interest: it is the only restaurant in Helsinki that features Viking themes. Its name is the Ravintola Harald, and if you go with a group of people you can have a Viking Dinner or a Buffet. It has subsidiaries in other cities too, so if you want to go Viking, you can do it in many places in Finland. You can also go to G.W. Sundermanns restaurant in Helsinki. It was awarded the “Best of Award of Excellence” prize from the US based Wine Spectator magazine in 2012. In other words, this is the restaurant with the best wine in the capital of Finland, since the awards of this magazine are the Michelin Stars of wine. Have you tried any of those restaurants in Helsinki? Have you tried another one that you want to recommend? There was, a long time ago, a website called “Virtual Finland” in Spanish. I used to check it out before going to Finland in order to get to know the country and the Finns themselves better: I wanted to be prepared. The website doesn’t exist anymore, but thanks to this article (SPA) I found out the 10 things that make a Finn happy. As this webpage said – and as we reviewed in our Spanish version a while ago – recently a popular Finnish magazine called Seura (which in Finnish more or less means “in good company“) commissioned a big survey to find out where the Finnish happiness is at. The survey consisted of 678 questions and was given to 1015 people. After the good reception of the post “The 10 things that make a Finn happy” on both the English and Spanish version of Big in Finland, I became interested in writing a similar post. The closest thing I found is a list of the 12 favorite Finnish words , chosen by Finnish poets (original here). According to the poets, the list of the 12 favorite Finnish words goes as follows. There is no single defining criteria to the list, really. The words were not chosen by how they sound, what they represent, or by their relevancy in the everyday life of a Finnish poet. Maybe the list includes a bit of all of that. This is the Top 12. I believe, and this is personal, that the ones that were voted onto the list by their relevance were Lauantai (of course, the day of resting), metsäpirtii (the Finnish forest cabin that every Finn has), lumi (the snow they see for the most part of the year) and hiljaisuus (the silence, something that the Finns revere and love, as it is better to say nothing than to say something bad). Maybe not so common but desired are aamunkoi (wanting the sun to come back after 20-hour long nights in the months of winter is pretty important), lauha (mild temperatures when it is -30 degrees Celsius out there is also desirable) and kuulas (this one maybe becomes especially important on Sunday mornings while fighting a hangover). Nuttu might be on the list because the Finns don’t wait as long to have babies as people of other nations do. Finally, aalto and maalima don’t tell me much besides being beautiful words, so we would have to ask the poets about the reason of them being on the list. 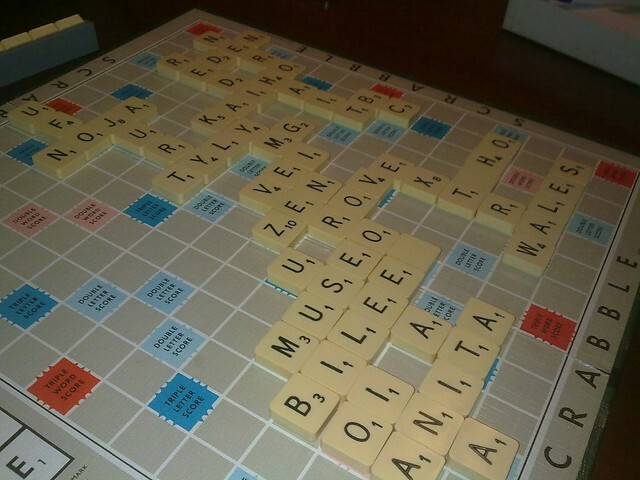 What are your favorite words in the English language? And in Finnish, of course. If I have mistranslated some of those 12 Finnish words, please also let me know in the comments. If you were asked to name a statue from the top of your head, you’ll probably say “The Venus of Milo”, as it might be one of earliest encounters with sculpture we all had. But if you ask this question in the Finnish town of Parikalla, in the south-east of Finland and next to the Russian border, the answer will surely be the strange sculptures of Veijo Rönkkönen. 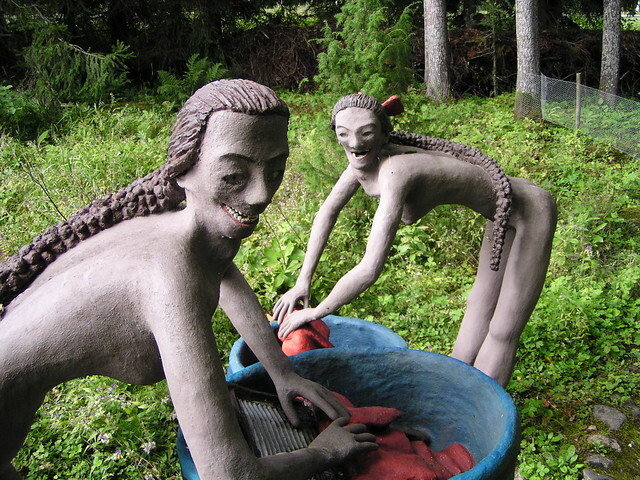 Women washing clothes. 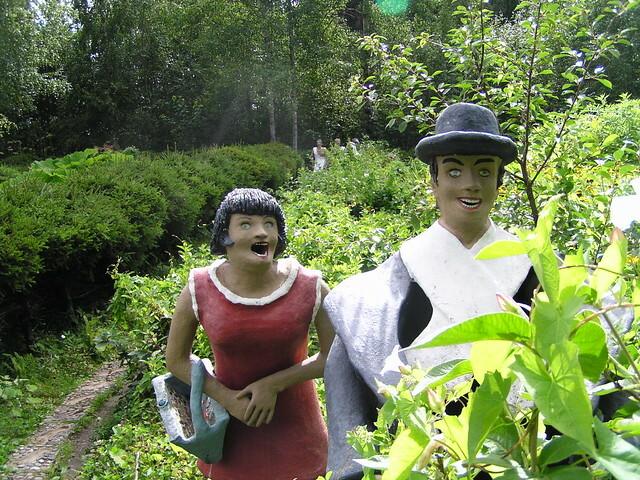 Two of the many sculptures you can find in this strange park. This photo and all the others were made by Mike Ancient with CC (by-nd-nc) license. Veijo Rönkkönen (born in 1944 and passed away in 2010) was a Finnish artist and sculptor. During his youth, while working at a paper factory, he started to make sculptures. He finished his first sculpture in 1961 and continued sculpting all his life, finishing around 450 statues. 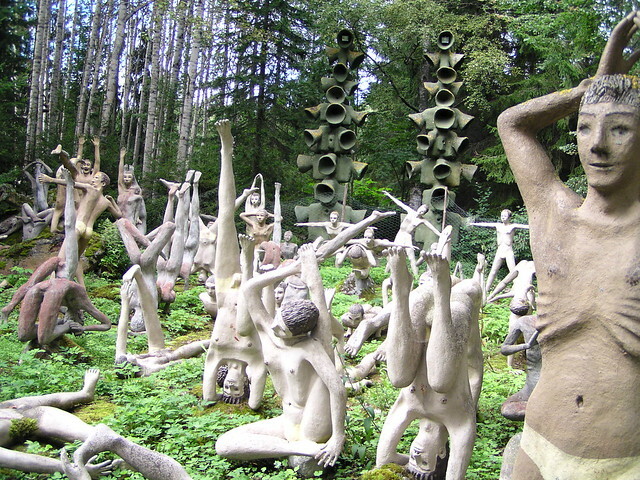 All these statues are now standing in the park-like garden of the house where he lived with his parents. Veijo never stopped living in that house, and he was a man who loved being alone. By placing his statues in the park, he made them available for anyone to see, but he never came out to talk to any of the visitors. He instead left a guestbook with a sign asking visitors to leave a note. The man here plays Kantele, a traditional Finnish instrument, while the ladies dance. Veijo never agreed to lend his statues to museums or expositions. When asked about it, he said he must “check with the statues first”. 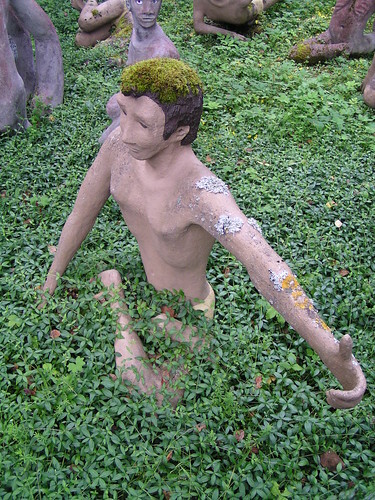 They must have always said no, since up to today none of the statues have left their places in the garden. In 2007, three years before his death, he won the Finlandia prize (a multi-disciplinar prize granted annually), but he didn’t attend the ceremony to receive it since he didn’t want to leave his house. It was received by his brother in his name. 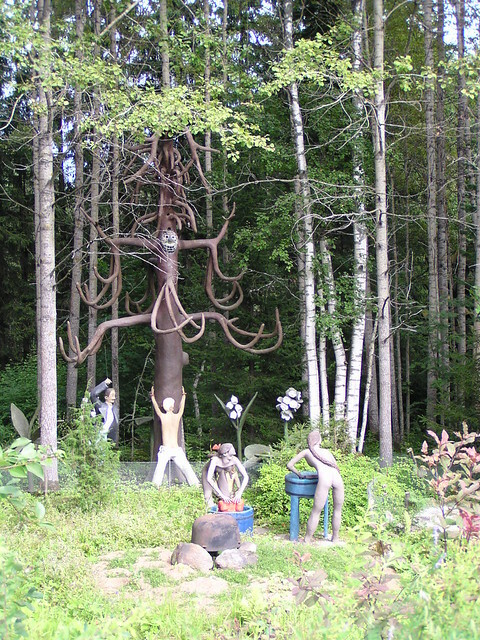 The park is the most important set of pieces of contemporary folk art of Finland. The facial expressions of the statues, made from concrete, are part of what makes this group of statues unique. Their expressions are scary, since they aren’t fully realistic: instead they come close to the Uncanny Valley. Some of them also have real human teeth, and sound effects that make the whole park even creepier. 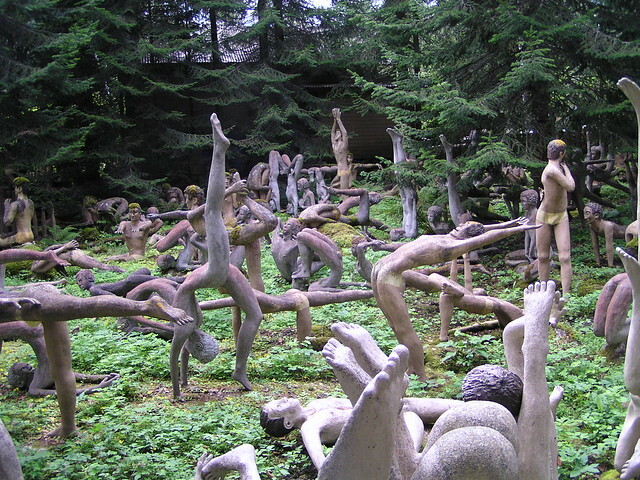 The biggest part of the statue collection is formed by 200 statues in different yoga positions, something that Veijo Rönkkönen knew to perfection. Statues in different yoga positions. The exposition has turned into a tourist attraction for the little town of Parikalla. Around 25.000 people visit there every year and the new owners of the park after Veijo’s death have planned to make his park an even bigger attraction. 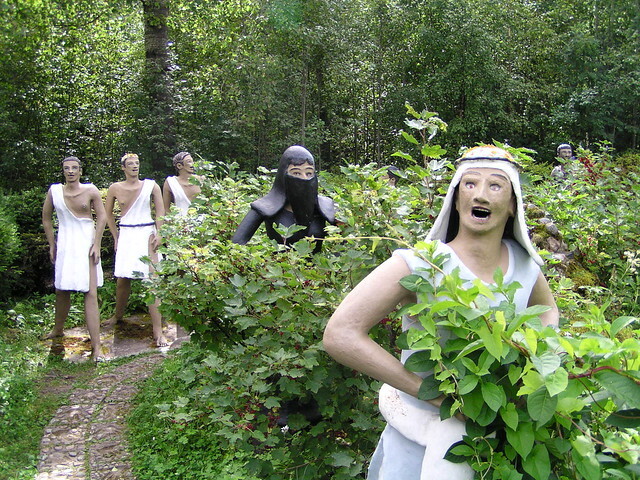 To pique your curiosity, you can check out the entrance to the park with Google Street View, and see many more photos of Veijo Rönkkönen’s statues on Findart.fi. Here is also a video in which some tourists make a tour through the park, showing the statues. What do you think about these unsettling statues? Which one is your favorite?